Joy LaDawn Hill-Watson held Noble Hill Wheeler Memorial Center with high standards and regards as the first Rosenwald-Funded School in Northwest Georgia built specifically for the Education of African American Children. Joy took pride in sharing the Noble Hill School story. Joy was a great Director who took her job seriously. She also went above and beyond the call of duty to touch the lives of others. She was a woman of vision, a powerful anointed singer, director, teacher, coordinator, friend, and an outstanding leader in the community, church, schools, clubs, and organizations. Joy was a very unique woman, who love the Lord and would remind others to follow their dreams and pay it forward. 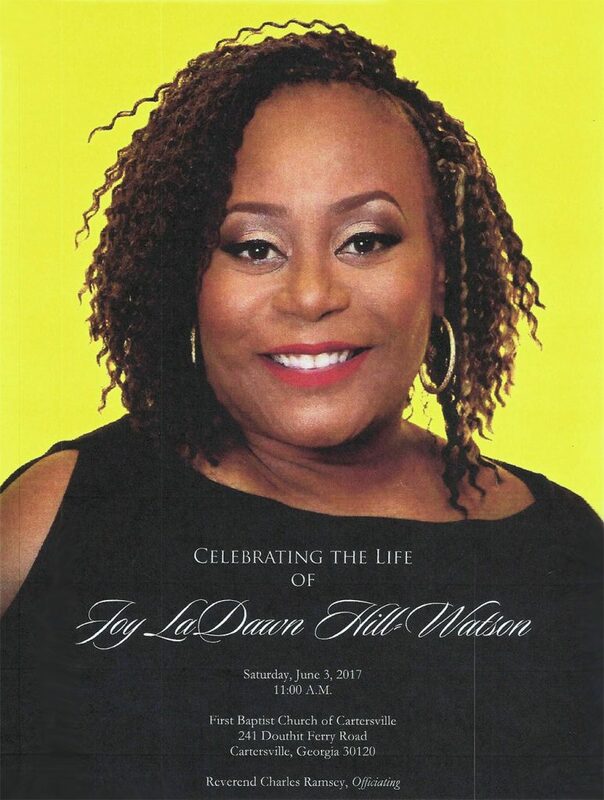 Joy will forever have a special place in the hearts of her family, friends, community, & the Noble Hill- Wheeler Foundation Board and Staff.